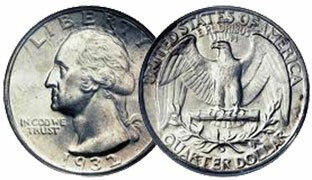 The Washington Quarter coin is the present quarter dollar coin or 25-cent piece issued by the United States Mint. The coin was first struck in 1932. The Washington quarter coins entered circulation on August 1, 1932; they were struck in that metal until the Mint transitioned to copper-nickel clad coinage in 1965. A special reverse commemorating the United States Bicentennial was used in 1975 and 1976, with all pieces bearing the double date 1776–1976; there are no 1975-dated quarters. Since 1999, the original eagle reverse has not been used; instead that side of the quarter has commemorated the 50 states, the nation’s other jurisdictions, and sites—the last as part of the America the Beautiful Quarters series, which will continue until 2021. The bust of Washington was made smaller beginning in 1999; in 2010 it was restored to bring out greater detail.